For anyone who has suffered some sort of depression, clinical or otherwise, its stresses and detrimental affects will be much recognized in this new 85 min opera, The Anatomy of Melancholy by live arts based company bodycorps, finishing its short run at Testbed1 tonight. The performance begins almost as the audience enters the space through a short narrow passage way, passing an immobile body laid out as if on a cold plate in a morgue- and its poignant beginning has a rather fitting and low key answering finale, ending with an understated question rather than a resolution that can come to some conclusion about the subject matter upon which the opera is based- and Robert Burton’s 1621 publication of the Anatomy of Melancholy. 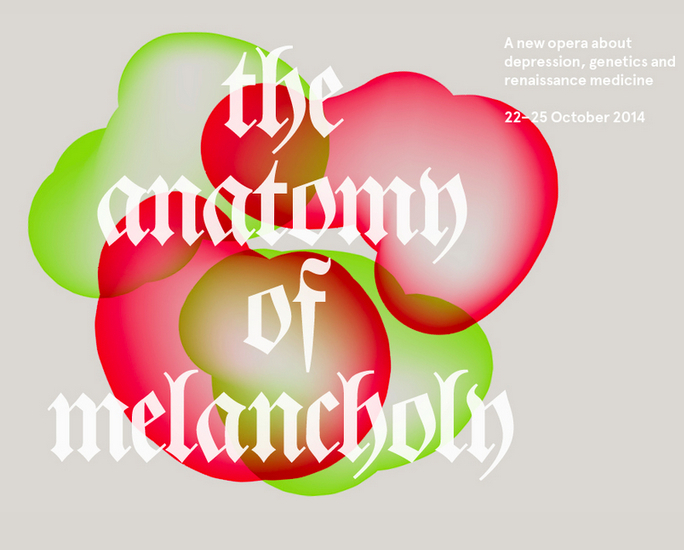 In the Renaissance ‘melancholia’ which in modern speak really means clinical depression, was believed to derive from the imbalance of the four humours, an idea from the Greeks who proposed the body to be made up of black and yellow bile, blood and phlegm/ water. But as if taking cue from that work, which is often described as a stream of consciousness or a lens through which Burton could consider the whole of humanity, librettist and director Finn Beames takes that as his starting point [and style] and leads us through, with a back story of a depressed son [John Lattimore] his anxious father [Mark Beesley] and his narrating Grandmother [Janet Henfrey], to modern day science and genetic research- with a supportive chorus as the four humours. There are clever references made to the Terracotta Army of Qin Shi Huang [perhaps in some ways to articulate the lifelessness depression can bring to a person] and Goethe’s The Sorrows of Young Werther, a novel from the sturm und drang period where the author charts the harrowing affects of unrequited love- at the time the hero’s suicide produced many copycat actions across Europe. There is even a suggestion that depression is a product of post colonial Britain, as if the hamatzav like situation, Britain’s guilt towards the rest of the world, provides the need to construct alternate realities and failing that- and the ability to deal with being a ‘slave’ or subject to the Queen, means a retreat into the indoors, or rather, depression. It can’t be by chance that the son constantly refers to reading and to be needing to be read to, as if one ideology or reality, can possess or get rid of another. One underlying message is clear, ordinary people become depressed- but what is not clear is how ordinary those people are in the first place or whether they are mere products of the world around them and the myths that perpetuate their ordinariness- hence the scenes where the chorus become ‘ordinary men and women’ or ‘city slickers’ who all succumb to depression. Perhaps, as in Darian Leader’s words, those who realise they are insane are not at all, it is those who think that they are sane who are mad. That in itself, is a cause for anyone to be depressed. Use of live video allows the audience to get closer to the characters- the opposite effect of how depression can affect relationships between loved ones and friends. But it also serves as if a microscopic lens, the son is the subject, the specimen to be studied to see if a cure can be found. John Lattimore [as the son] gives a moving portrayal of a man struck down by depression- his body language has the immobility and slowness and sometimes vacuousness that depression can bring to a person and one can feel the blue melancholy going all the way down to his shoes [as the song goes]- his beautiful countertenor gives ethereal weight to the dislocation and sense of unrealness that the illness can bring. Having the Grandmother as the ‘narrator’ is a brilliant move- almost as if Janet Hanfrey is a modern day Robert Burton, she provides an authorial weight to a piece which is more like an operatic essay or an epistolary. As the rather brusque father, Mark Beesley had me thinking of the rather over bearing parental figures in Nic Ray’s films – his was a wonderful portrayal of confusion and incomprehension. The orchestral commentary, under the musical direction of Tim Murray and provided by a small chamber group, composed by Benjamin Tassie, included an assortment of low flutes and percussion and passages redolent of Holst’s Neptune from The Planets. The quietness and sad melancholy of their themes gave respite from the sometimes-surging outbursts from the singers deep in pain and also provided the piece’s inner movement. There was a nice synthesis of design too from co designer Mayou Tikerioti [with Finn Beame] and lighting by Joshua Pharo- the rather deathly white effect, video screens and half light [with singers disappearing off into the darkness or hanging back to create symbolic shadows on walls] emphasized the strange immobility and the architecture that depression can have. Strangely inspiring, despite the opera’s last ironic word on depression, which sufferers all know to be sort of true, it’s a discursive essay on mental health. Fact is adequately measured side by side with a fictionalized bubble and emotion – it feels here that opera has been let off the leash at bit into something new, experimental and modern. Watching it, it seems that opera could go anywhere.